A kitchen utensil used to reduce whole soft foods, such as cooked potatoes and carrots into smaller bits. This utensil, much like a garlic press but larger, has an open chamber, which is generally 3 to 4 inches wide. A ram or plunger connected to the handle of the ricer is pressed down onto the food, forcing it through the many small holes in the bottom and sides of the container. As the food is extruded through the holes, it looks like strands or grains of rice. 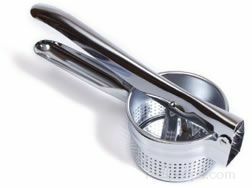 This utensil is also called a potato ricer and can be found in many stores offering baking utensils.